Making a second pilgrimage to the Land of the Rising Sun has been on my agenda almost since my departing flight just over eighteen months ago. Japan is in so many ways like stepping into a different world, in the best possible way. It is an escape from the bustle of western europe into a country where politeness, friendliness, and efficiency are the absolute norm. Case in point was immigration, a sharp contrast to the experience just thirteen hours earlier in France. In just forty minutes from disembarking our flight, we had cleared immigration, reclaimed baggage, cleared customs, found the train station, arranged our unlimited railway passes, and boarded the express train into the city, which left to the split second of when the timetable said it should. It would be remiss of me not to say at least something about my first long haul flight in the custody of Air France. Apparently the airline has redesigned their cabin interior of late, and the result is wonderful. Flights over ten hours are generally speaking purgatory, but this one was fine. There was adequate leg room, excellent food (yes, on an airline), and a rather nifty camera system that let passengers see the ground under the plane. True, ten minutes of fields and this got boring, but it certainly had novelty value. The only catch was twenty five minutes of taxiing on landing in Tokyo, but this probably isn't the fault of the airline. The only real catch with travelling to Asia from Europe is jet lag. As I type this, it is one minute to midnight at home. Here, however, it's eight in the morning, and a whole day awaits me on something approaching non existent sleep. It will be interesting. Though both of us had been to Toshimaen two years ago, weather conditions had resulted in all the coasters in the park being down for the day. In the run up to this trip, we had been keeping a careful eye on the forecast, with an eye towards dropping the park if it wasn't gloriously sunny. As it turned out, we need not have worried; it was a beautiful morning. The park is no more than two minutes walk from a subway station on the Toei Oedo line. The first ride of the trip, chosen entirely because it was the first one we reached, was the powered Blauer Enzian, a Mack-built clone of the Pinfari ST40 powered coasters. This model had to be running at something very close to full throttle; it was moving round the track at an incredible rate, with riders feeling strong forces in the turns. Two circuits were taken at maximum speed, with half a circuit accelerating and half a circuit slowing down again. In common with quite a bit of the park, the ride was placed on the roof of a building, making the most of available space. If there is a signature coaster at the park it has to be Cyclone (#937), a pretty old Togo design that eschews the usual shallow drops of Japanese-built coasters with some steep manoeuvres which the train takes very well. There is an underground helix towards the end of the course that is in many ways the highlight of the ride; all passengers can see or feel is the rush of wind going by. 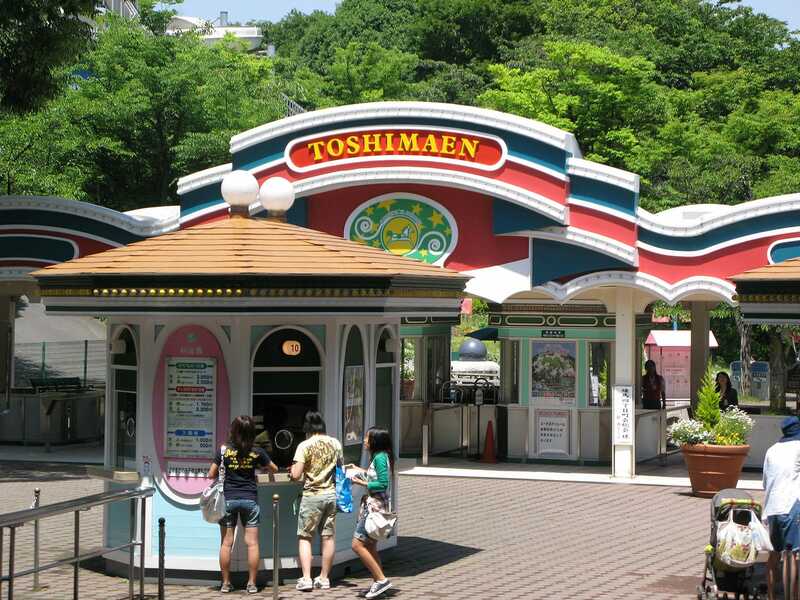 In short, a hidden gem; Toshimaen is home to what has to be one of the best family coasters in Tokyo. Unfortunately, the other two coasters at the park were unavailable; the Corkscrew was down for maintenance and the Shuttle Loop wasn't scheduled to open until the afternoon. We certainly could have waited around for the latter, but we had finished the park otherwise, and any extra time spent here would have reduced what we had for the next park. Our reluctant decision to abandon it turned out to have been very fortunate, due to slightly over-optimistic expectations of how long it should take to change trains in Shinjuku. In planning this trip we had a bit of fun trying to figure out what the closest train station to Fuji-Q Highland might be. There are a whole series of stations with fuji in their name. Fortunately, a bit of pronunciation in a Japanese accent made it clear; the target was of course Fuji-kyu-hai-rand-o! As it was, we arrived in the park with five hours to go before closing. It might have been reasonable to assume that this would be enough to have an enjoyable afternoon, but it was not to be. In the past I've heard the park described as the Six Flags Magic Mountain of Japan, and it's hard to argue; otherwise excellent rides were being run at a fraction of their design capacities due to ridiculously slow loading procedures, there was a blanket ban on wearing secured glasses on ride, and admission was very expensive. 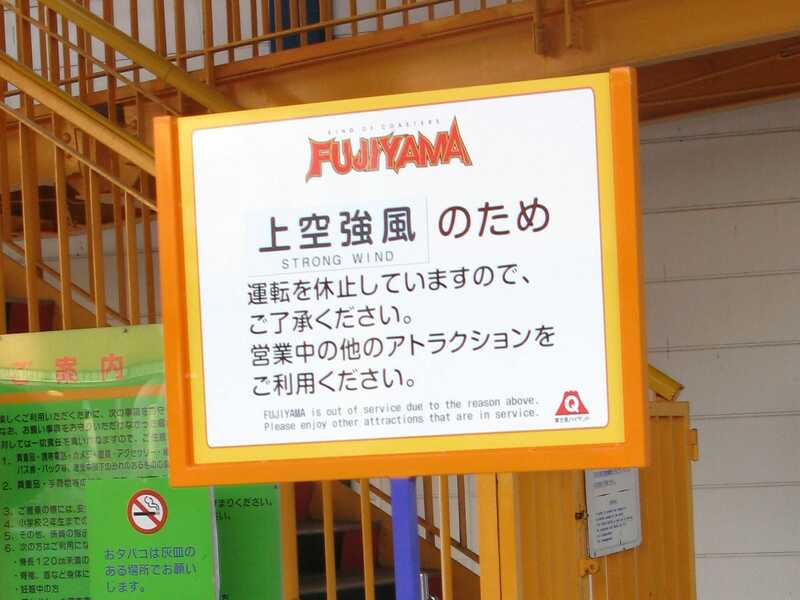 Oh, and lest I forget, Fujiyama went down for the night due to strong winds when we were about a train load away from the front of the queue. The powers that be clearly don't want me to experience this coaster, though at least I now have an exit pass for the next time I'm in Japan. The reason for returning to the park was of course the new 4D coaster, Eejanaika (#938). The park has put their marketing machine into overdrive, and the ride proudly boasts about holding the Guinness world record for the number of loops. It is certainly true that riders are inverted a total of fourteen times while on board, though to call these loops is stretching reality just a little. Perhaps a fairer record to assign would be the number of times riders are punched in the head, stomach, thighs, back, and all other convenient body parts. Though the motions of the ride were exciting and could have been fun in another context, riders are shaken and bashed so regularly that the only thought left for the mind is when will this torture be over. To describe Eejanaika as brutally painful does a disservice to the words. It is abominable, appalling, dreadful, hideous, horrible, nauseating, vile, and to summarise, generally not good. In reality, the queues at the park were so bad that we only had time for one other coaster; Dodonpa. As with my last visit, the launch has to be one of the best moments on a coaster anywhere on this planet, easily the stuff number one attractions are made of. Unfortunately the rest of it is dull, save the crest of the tower in the middle of the ride, which is painful. Also, as good as the launch is, it's not worth waiting two hours, and riders only have to do that because the park takes two minutes to load and check each eight seater train. It has taken me a while to realise it, but I've decided that I greatly prefer small family run parks to the large corporates. Having to wait for more than twenty to thirty minutes for a ride, even a signature coaster, detracts greatly from the enjoyment value. Furthermore, spending nearly five hours in a park and only having time to get in two rides is not my idea of fun. Fortunately most of the rest of this trip is smaller parks, and there's a lot to look forward to.